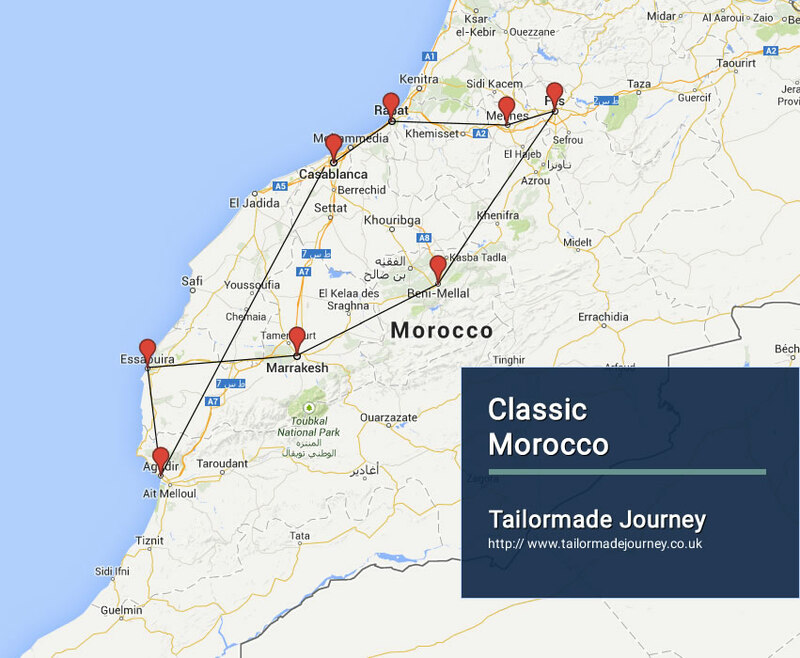 Discover Morocco by Visiting the Major Cities and ports of Morocco though the Classic Morocco Tour. Visit Casablanca, Fez, Marrakech and in the end relax on the Beaches of Agadir. Arrive Casablanca 2 Nights > Drive Rabat > Drive Meknes > Drive Fez 2 Nights > Drive Beni Mellal > Drive Marrakech 2 Nights > Drive Essaouira > Drive Agadir 3 Nights > Flight Casablanca 1 Nights & Leave. Overnight Stay at the Hotel in Casablanca . Breakfast, visit of the economic capital of Morocco: the central market, the Habous district, the Royal Palace, the Mohamed V square, the residential area of Anfa and the outside of the mosque Hassan II. Overnight Stay at the Hotel in Casablanca. Overnight Stay at the Hotel in Fez. The whole day is devoted to the sightseeing of Fez, the oldest cultural and spiritual city of Morocco. The clients will see the craftsmen working in the old-age way with a possibility to buy one of these items, lunch at leisure and continuation of the city visit in the afternoon. Overnight stay at the Hotel in Marrakech . Overnight stay at the Hotel in Agadir. Overnight Stay at the Hotel in Casablanca.